CAT, MAT, and GMAT are the prominent management entrance exams that are conducted every year for admission to management colleges across India and across the globe. The below table lists the differences between the above mentioned management entrance exams. Conducted by the IIM’s. Conducted by the All India Management Association (AIMA), New Delhi. 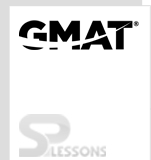 GMAT is a registered trademark of the Graduate Management Admission Council, which is a global nonprofit organization, composed of graduate business schools located in the United States and around the world. 21 day testing window (estimate but may vary) in the months of October and November. Exams are conducted 4 times in a year in the month of February, May, September and December. The GMAT is given year round during normal business hours, not more than 5 times in a year.